Shawn Mendes onstage at TD Garden Wednesday night. Pop music has already gone through a lot of cycles in the 2010s, but one thing has remained consistent: America’s biggest teen idols have come from outside lands. Justin Bieber, from the Toronto suburb of Stratford, exploded out of YouTube in 2009 and graduated to full-on pop adulthood with his 2015 album “Purpose”; One Direction, a fivesome put together by the British flagship edition of the Simon Cowell-helmed talent show “The X Factor,” ruled the roost until going on “hiatus” in 2016; and now Shawn Mendes, a guitar-strumming teen from another Toronto-adjacent city (Pickering), is filling arenas with young devotees who, as they showed on Wednesday at TD Garden, are more than ready to scream and swoon along with his every word. Mendes’s ascent began in 2013, when he began posting brief covers of Lana Del Rey, Bieber, and other pop lights to Vine, the six-second-video-sharing service launched by Twitter that year. (It closed this past January.) The following year, he released a self-titled EP that featured the be-true-to-yourself piano ballad “Life of the Party.” While that song only peaked at No. 24 on the Hot 100, it did catch the ears of young pop fans, priming the pump for his peppy debut album “Handwritten” to open atop the Billboard 200 album chart in 2015. In 2016 Mendes released “Illuminate,” which represented growth for him both lyrically and musically; the then-18-year-old singer (he turned 19 a few weeks ago) brought a more forthright sexuality into songs like the airy “Lights On,” while the stormy “Bad Reputation” hinted at musical aims beyond the revved-up jangle that hit big on pop radio. Mendes’s playlist presence is still rooted in that style — the possibly-bad-romance chronicle “There’s Nothing Holdin’ Me Back,” which pivots on a jumpy riff and strutting beat that recall Ed Sheeran’s looped-guitar rave-ups, is currently at No. 7 on the Hot 100. 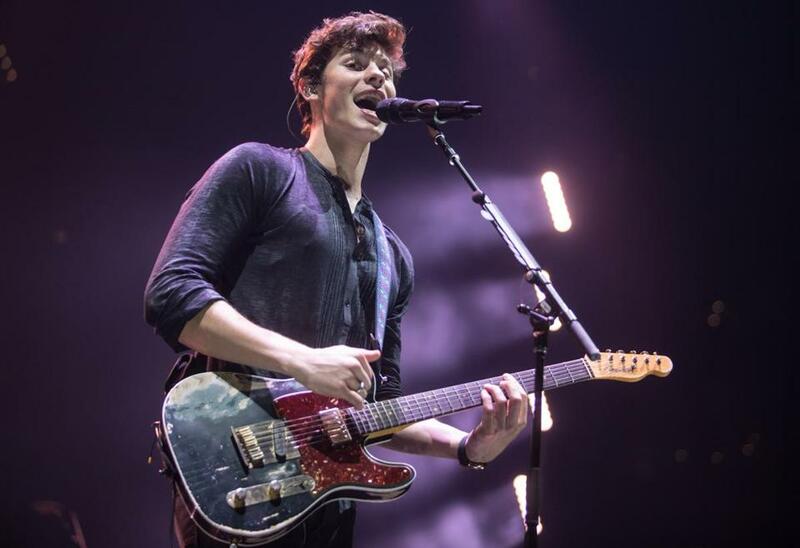 Mendes’s onstage charisma has multiplied since his first Boston appearance, a four-song solo set at Blue Hills Bank Pavilion in August 2014. His voice has a slightly nasal quality that gives his proclamations of love a touch of winsomeness, and his statements about feeling bummed out a late-night-confessional quality — all of which shone through even as the crowd’s screams richocheted off the rafters. His songs do tend toward similarity at times (the show-closing profession of love “Treat You Better” is a speedy bit of guitar pop that could be an inversion of his 2015 smash “Stitches”). But the moments where he used his raspier voice, or led his band through rock heroism, offered a glimpse of his potential for the years after his idoldom fades. Berklee grad Charlie Puth opened the show with a brief set that showcased his bland affability and pleasing falsetto (as well as a personalized Celtics jersey he’d initially hidden under a baggy sweatshirt). His soul-tinged take on middle-of-the-road pop includes the ill-advised come-on “Marvin Gaye,” on which the refrain “Let’s Marvin Gaye and get it on” is only one of many groanworthy lyrics; it wasn’t much improved by the absence of girl-power irritant Meghan Trainor on Wednesday, despite his crack backing band. Puth’s solo version of the 2015 megahit “See You Again,” which ruled that summer’s charts in Wiz Khalifa-assisted form, was poignant, preceded by a dedication to the late friend who was its subject. But his current hit “Attention” is a lugubrious funk-pop track that borrows everything but the charisma from one-time teen dream Nick Jonas’s 2014 smash “Jealous”; while his guitar player’s counter-melody added compelling textural elements, they were outweighed by the lyrics’ curdled regret.